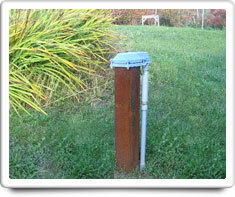 Well Water is water for your home that comes from naturally occurring groundwater that is pumped up from the ground. Well Water can be used for drinking, bathing, etc. inside your home, or it can also be used for outdoor irrigation for your Lawn & Landscape. Groundwater is typically clean and safe for consumption, because the overlying soil acts as a filter which enables the groundwater to be typically free of disease-carrying microorganisms. However, contamination may occur after a break in the pump casing, or as a result of contaminated surface water entering the well. Shown in the 'Routine Care' section are the recommended routine maintenance tasks for your well water. The 'Q & A' section shows answers to common questions. And the 'Articles' section provides helpful articles about your well water.